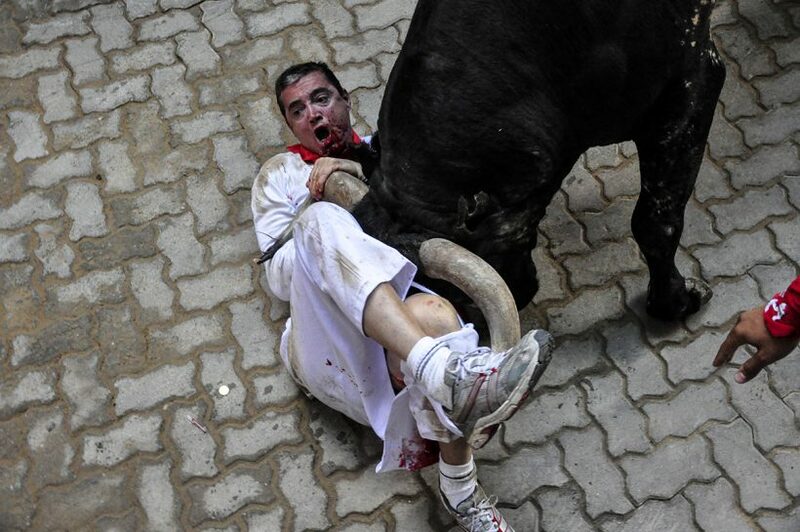 Sometimes the photos of the Running of the Bulls can be a little or indeed a lot, hard-hitting ones. Like this one which was chosen by José Antonio Pérez Gómez, another one of our special group of photographers at Sanfermin.com. Funny enough, the bull shown here is Ermitaño, the self-same Miura bull that wished to charge another of our photographers, Javier Ibáñez. José Antonio Pérez was sitting at the 4th or 5th post of the fencing on the left side, at the start of the final stretch leading into the bull ring, on the side where nobody wants to go as the bulls usually tend to pass on the right side. The bull shown in this snapshot goes by the name of Ermitaño from the Miura bull-ranch – of the most fearful bull-breeds – was on its own and in an anxious state after having charged some runners at the top of Estafeta Street and where it had made several turns. “Suddenly, the bull leaped forward, to the surprise of the runner and, in a few short steps it caught him, the bull tossed the runner high under the nose of the photographer and dragged him to the doorway entrance where it gored the runner. After playing for a moment with the runner, the bull tossed him once again towards the middle of the course and the runner landed just beside the post where I was positioned. Here, the bull give him a good drubbing and tossed him up and down like a rag doll… in all positions. As it had already gored him at the neck, on being now faced downwards, the blood spilt all over his face and forehead and that is what makes the photo so dramatic looking. Both the local policeman by my side and myself were so petrified that we were not even aware of the danger that we were risking by being so close to the fencing, and with that huge bull just two meters away”. The hand that can be seen in the image belongs to a Red Cross volunteer who was trying to grab the fallen runner and drag him away under the fencing. After goring the runner yet again in the thigh and leaving him just in his underpants, the rest of the runners managed to distract Ermitaño and the bull continued on its way into the arena and away to the pens. When I entered the offices of Sanfermin.com it seemed like I was drugged from the adrenalin that was flowing through me and I was trembling like a leaf”. The photo is from Sunday,12th of July, 2009.